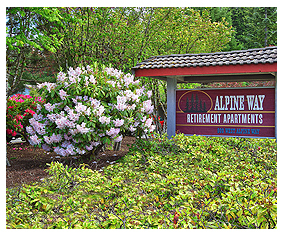 At Alpine Way, we offer a wide array of services that are available to all of our residents. From assisted living to memory and Alzheimers care, our compassionate and experienced staff provide an enthusiastic and personalized approach to the daily interactions with our senior residents. Consistency, routine and a focused attention on each individual is just part of the care we provide, each day, in a warm and familiar environment. We understand the importance of getting to know our residents on an individual level. Our resident’s life stories are so important to us. Through their stories, we are able to obtain a deeper understanding of each person’s history; and therefore, help to create moments that are meaningful in the present. We consider the interaction between our residents, the family, and Alpine Way to be a partnership. As such, we work together to provide a customized service plan that encourages each resident’s independence while creating a support system within the Alpine Way community. We believe this provides them with something that is so important to us all; a sense of belonging. Because living with a pet promotes less stress, better health and overall happiness, we gladly welcome your pets. We understand leaving your beloved behind is not an option. After all, they’re a member of your family and we look forward to them becoming a member of ours!